This week, the Ms. Foundation came out with a new campaign: #MyFeminismIs. The campaign invites feminists to describe what feminism means to them – and in a world where “feminist” can often be misconstrued as a dirty word, it’s a refreshing change of pace. Feminism is a movement open to everyone. It doesn’t require you to be a woman, any certain race or any particular class. The only requirement is that you believe in treating people equally and granting them equal opportunity to get ahead. That’s it. I was raised in a feminist household – my mom bought me “The Feminine Mystique” when I was 13-years-old, and I wrote an extra credit book report on it (yes, I am that much of a nerd). I’ve interned at three feminist organizations, and worked at two of them. I am currently a Professional Feminist. 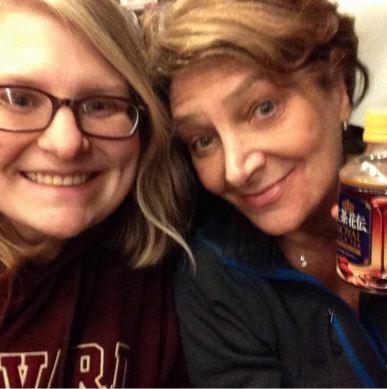 Becka and her feminist mama drinking milk tea on a bullet train during a family trip. Sometimes, it can be easy to get caught up in the nuances of feminism and become frustrated with the exclusionary feminists out there – a select few feminists who are not willing to recognize the trans community’s struggle for bodily autonomy and the right to express gender however they see fit as a feminist issue. There are also feminists who don’t believe the struggles for gender equality, racial equality and economic opportunity are intertwined. #MyFeminismIs not that feminism. #MyFeminismIs a movement to bring everyone around to a vision of women having political, social and economic equality to men. #MyFeminismIs one that fights for equal rights for the entire LGBTQ community, as well as racial justice and immigration reform. My feminism understands that we cannot have equal economic opportunity without fixing the fact that women make 78 cents on average to every $1 a man makes (and that number is way worse for women of color), without access to birth control and abortion, and without access to paid family leave. 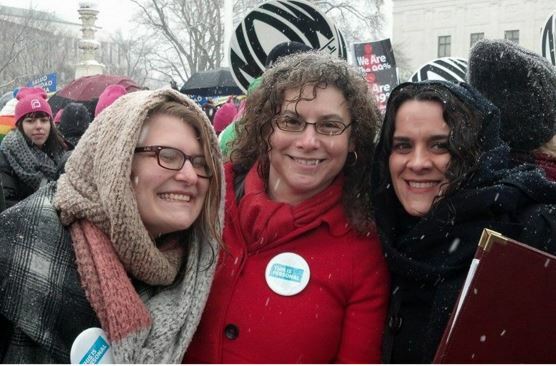 Becka with two of her badass feminist colleagues rallying for the right to affordable, accessible birth control. My feminism loves and accepts everyone. It advocates for everyone to love and accept themselves, and works for a society that does the same. It wants to inform and educate everyone who doesn’t understand feminism – who thinks it’s about hating men, or only a movement for white, cis, straight women – about what it’s really about.